And they’re totally worth seeing. Here’s why. 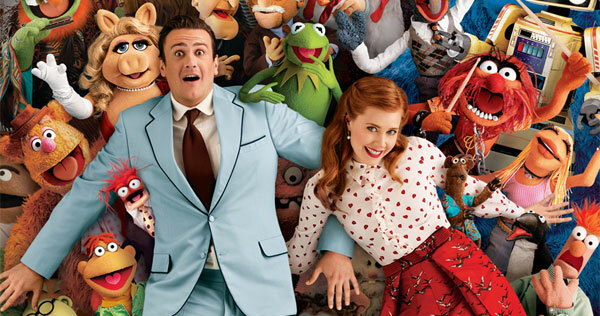 Jason Segel could not have been paired with a better counterpart for this movie. The two are absolutely perfect for what The Muppets are trying to do. They are each so nice to the point where it’s almost disgusting and just have an adorable presence. Also, the two of them shine during the musical numbers in the movie. The play perfectly off each other, and they add the right amount of human element. The Muppets features a few original musical numbers that are very enjoyable. While I initially assumed Jason Segel wrote them (since he co-wrote the movie and wrote the original music from Forgetting Sarah Marshall) I was pleasantly surprised to find out the Bret McKenzie from Flight Of The Conchords was behind the music. This made sense for two reasons. First, the movie was directed by James Bobin, who created Flight Of The Conchords. The second involves the actual songs themselves. While listening to the musical numbers during the movie, the first thing I thought was that they sounded like a PG-rated version of a Flight Of The Conchords song. Turns out that was exactly it. The songs range from typical musical songs to love ballads with everything in between. Obviously one of the main reasons you’d go see The Muppets is to see the Muppets. After breaking up years before, the gang slowly gets back together with the help of Kermit and Jason Segel’s brother in the film, the newest Muppet, Walter (Yes, a man and a Muppet are brothers in the movie – just go with it). All the Muppets are back, and the movie does a great job at playing with the nostalgia of the characters while adding new stories and personality quirks. Also, Walter is the perfect addition to the Muppet family, and he’s just a fun guy to follow around for the movie. While the movie revolves around the Muppets, Segel, and Adams, a number of actors cycle through the movie. This incredible list includes John Krasinski, Neil Patrick Harris, Feist, Alan Arkin, Ken Jeong, Zach Galafianakis, Jim Parsons, Kristen Schaal, Emily Blunt, Whoopi Goldberg, Dave Grohl, and James Carville. That’s in addition to the actual roles in the movie from Rashida Jones, Jack Black, and Chris Cooper. Some of the cameos are so subtle it’s perfect, like Dave Grohl drumming for the Moopets (the poor man’s Muppets) or Feist delivering one line in one of the musical numbers. One of the greatest cameos comes from Jim Parsons, but you’ll have to watch the movie to find out when he comes in. While the movie is rated PG, there are plenty of moments that you can enjoy as adults (even after the cameos). Most of these scenes come in the little moments where the writing nods at the audience. Co-writers Jason Segel and Nick Stoller are fully aware this is a movie, and they make sure the audience is aware of it also. What seems like a cinematic spotlight with sappy music is actually just a bus driving by. When a musical number ends, the backup dancers fall over in exhaustion. These little moments are the ones that sustain the smile that begins the moment the movie starts. If you want to see some clips from the new movie, check them out here. Bryan Berlin is a comedy writer and is the Creator and Editor-In-Chief of Broken Spork. You can follow him on twitter here.